Grant, a former army captain, will be riding (and leading) Marv - a 16.1hh Clydesdale cross gelding (10 years old) from John O'Groats to Land's End (1100 miles). 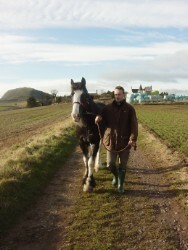 The solo trek will be unsupported and Grant will be sleeping out with the horse on many nights. He expects to average 20 miles a day and have one rest day per week. Grant is paying the full cost of the trek. All monies raised will go to the British charity, The International League for the Protection of Horses. For more information, please visit Grant's website.